Many entrepreneurs start their own companies after seeing potential business opportunities from their employers. Barry Edwards, President of the Louisiana-based Creative Presentation, Inc. saw an unclaimed yet promising niche in the computer industry that his employers failed to see. Though young, inexperienced and without capital, he took the leap of faith and started his own company specializing in visual communication systems. Creative Presentations (http://www.creativepres.com) was founded on November 2, 1990 in New Orleans, Louisiana, providing companies with a more effective means to communicate using electronic presentation methods and visual equipment. The company has become the leading provider of projection systems in both Louisiana and Texas offering client services such as integration, design and consultation for creating high technology environments. From simple projection systems, the company has since expanded to provide “meeting room solutions” that integrates an entire room from floor to ceiling – cables, sound system, projection screen, control panels, electronics – to help customers communicate better visually. Excited with his find, he went back to his office and tried to persuade management to purchase a line of computer projection equipment. Barry believed in the strong potential of the presentation products. “I knew I was going to be a good seller (of this technology),” he adds. Unfortunately, the management did not show any enthusiasm for the potential opportunity. “The company I was with did not believe that I could do it,” he says with a sigh. Undaunted by his frustrations, Barry believed that “in the middle of difficulty lies an opportunity” — a quote from Albert Einstein that he takes to heart. “So I prayed for direction from God. I didn’t know what to do.” Then, he was hit with a flash of inspiration: he was going to sell the presentation equipment himself, in his own home! He struggled with the decision for two months. He was young, inexperienced, and about to start a family. But he was determined to do it. He knew that computer projection systems were a growing business in other parts of the U.S., and his faith, determination, and passion pushed him to overcome his numerous obstacles. Not having enough business knowledge, he went on to educate himself on the rudiments of running a business on your own. “I did my research; checked a lot of materials from the Small Business Administration – how to start a business, manage a business. I attended seminars.” He also sought the advice of SCORE; a non-profit organization dedicated to providing advice to entrepreneurs. “So I did my homework. I’m gonna do it!” he exclaims. To raise capital, he went to different banks to inquire about a business loan, but they had no confidence that he, a “25 year-old kid,” could be successful in marketing an unheard-of product line. Instead, he borrowed $7,000 from his family. Susan, his wife, was extremely supportive and agreed to use their entire $3,000 in savings they had set aside for the birth of their first child. With this $10,000, he purchased the initial demonstration equipment on C.O.D. It was a huge gamble, but it paid off. 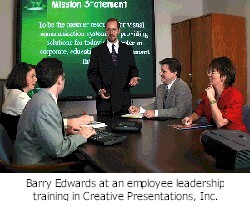 Barry incorporated his company Creative Presentations in 1990. He was then 25, with no line of credit, a computer borrowed from his former employer, a donated desk and file cabinet. Nonetheless, he was ready to go forward with faith and start his new career as a home-based working dad. Another strategy that he used is to sign up for a Mailboxes Etc. business address, instead of using his residential address. He also made sure that he comes to his clients, not the other way around to prevent them from discovering the simplicity of his business operations. Nevertheless, his approach with people worked and he made it through the first year of challenges, finding it to be very exciting. Barry put all of the profits back into the company, investing in more demonstration equipment, expanding product lines, and eventually attracting some extraordinary individuals. After a year, he hired his first employee, not in Louisiana, but in Dallas! “My first employee was a branch office person, so it is kind of peculiar.” As sales grew, he began hand-selecting exceptional team members to help build his company. He started hiring personnel in sales in Louisiana a year and a half later. Two more staffs were added two years later: one sales representative in Dallas and another one in Louisiana. For three years, he operated out of his 1,400-sq. ft. house. Now with four people working full-time for the business, plus a wife and a baby, the house has become too crowded. In 1993, Creative Presentations moved out of Barry’s house into its own office. Business grew steadily, and today Creative Presentations has six branches that employ a total of 40 team members throughout Louisiana and Texas. Barry’s investments have proven wise, as the company has demonstrated an impressive record of financial and personnel growth. Sales have grown from $180,000 in 1991 to $11,000,000 in 1999! As a company, Barry has chartered a new course that places less emphasis on the products and more importance on service. The company has developed new capabilities in the area of integrating various high technology audiovisual products into boardrooms and conference centers. As a result, Creative Presentations is now the number one dealer for InFocus Systems and Sharp in the States of Louisiana and Mississippi. These two companies are the top two manufacturers in the industry. Furthermore, Creative Presentations is moving towards full immersion into the exploding market of video teleconferencing and distance communication technologies. At the growth stage of his business, he considers cash flow and personnel as his main challenges. Learning how to lead and manage people was an area that he was initially weak at. “I had to learn how to lead people,” he says. Comparing the people-management skill to riding a bike, “You don’t learn (how to manage people) until you do it. I wasn’t a good leader in the beginning.” Today, one of his company’s focus is to develop innovative people and systems, institutionalizing such programs as Wellness and Community Outreach that allow members of various departments to come together and organize company-wide activities. As a result, his company has been able to attract above-average people, an accomplishment that he is proud of. Looking back, Barry has proven to be a skilled risk-taker who has demonstrated an intuitive ability to recognize unfilled needs in the market. His eye for innovation spills over as an asset to all areas of the business, as he is continually seeking out and listening for new ways to improve life for the company’s clients and team members. His advice to other would-be entrepreneurs? Barry Edwards has come a long way. Starting from scratch, “doing everything on my own without outside help; and growing it at this point with no large capital investment” is his greatest business accomplishment. Barry has a tremendous amount of energy, which is balanced well between his entrepreneurial and technical abilities. That is, his talent lies both in successfully starting ventures and following through with the focus and attention it takes to sustain them at a level of excellence. In May 2000, the U.S. Small Business Administration awarded him the Small Business Person of the Year for the State of Louisiana. He also received Top 20 Finalist for Entrepreneur of the Year honors for 1996 and 1999; and became a Nominee for Entrepreneur of the Year for the years 1997 and 1998. He was also honored by City Business as one of the 40 Faces of the Future of New Orleans. The award honors 40 young professionals whose success in businesses and organizations are setting the pace for the future. From a $10,000 loan to an $11 million dollar business in less than 10 years, leaving his job was the best decision that Barry Edwards has ever made.